Drawing inspiration from her far travels and local farmer markets, JUS Organic in the brainchild of Renee Dorski, an Atlantic Highlands-based mother of two and former international model. "JUS Organic was designed with the intention of embracing and adding to the community," says Dorski. The space is an open format, including a large community table and a unique corner devoted to kids, all with a bohemian vibe. Offerings are locally sourced, such as breads from Medusa in Asbury Park, while food is served on teak wood boards and furniture Dorski brought back from Bali. On the menu is a raw vegan cheesecake recipe graciously given by Lands End Cafe in Uluwatu, Bali to adaptogenic drinks using the much buzzed about Moon Dust from Moon Juice in LA. Dorski knew she wanted to open her own place after vivid memories cooking in the kitchen with her grandmother and later cooking for herself and friends after becoming vegetarian at age 15. 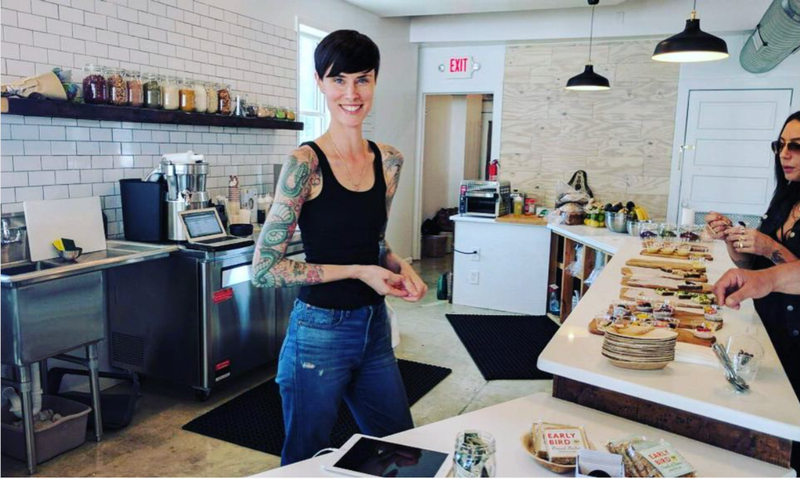 Her love of food brought her to be a chef at yoga retreats and private functions, while at the same time working as a massage therapist at the prestigious Mandarin Oriental in New York City for several years. A modeling career brought Dorski all over the world, where she lived in New York, Los Angeles, Milan, London, Spain and France (She still models when her schedule allows and walked the runway during the last New York Fashion Week. Having found a home base in New York City and then Brooklyn for over 12 years, Dorski met her husband Yoni Zilber, a tattooist with an international following and an owner of New York Adorned in NYC, as well as a private studio in the Atlantic Highlands. Traveling for months at a time where Yoni’s celebrity clients called, Renee and their two young daughters followed to Bali, Israel and Mexico, staying for months at a time. They now call Atlantic Highlands their homebase after falling in love with an 1800’s Victorian home and settling into the community. She is also on the board of her daughter’s Atlantic Highlands elementary school and plays bass in an Asbury Park mom-only band Mamadrama.